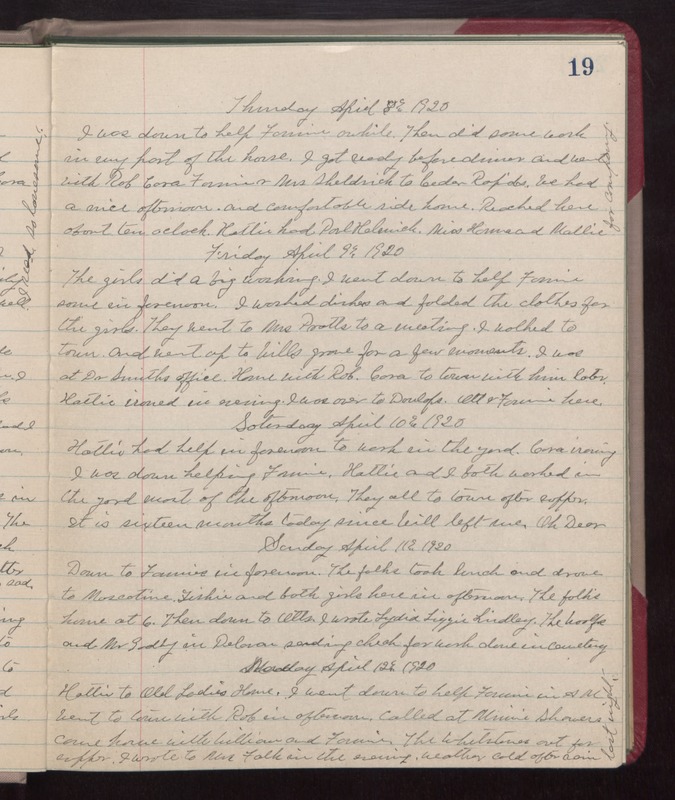 Thursday April 8th 1920 I was down to help Fannie awhile. Then did some work in my part of the house. I got ready before dinner and went with Rob, Cora, Fannie & Mrs Sheldrich to Cedar Rapids. We had a nice afternoon and comfortable ride home. Reached here about ten oclock. Hattie had Paul Helmich, Miss Howard, Mollie for company. Friday April 9th 1920 The girls did a big washing. I went down to help Fannie some in forenoon. I washed dishes and folded the clothes for the girls. They went to Mrs Pratts to a meeting. I walked to town and went up to Wills grave for a few moments. I was at Dr Smiths office. Home with Rob. Cora to town with him later. Hattie ironed in evening. I was over to Dunlaps. Ott & Fannie here. Saturday April 10th 1920 Hattie had help in forenoon to work in the yard. Cora ironing I was down helping Fannie. Hattie and I both worked in the yard most of the afternoon. They all to town after supper. It is sixteen months today since Will left me. Oh Dear. Sunday April 11th 1920 Down to Fannies in forenoon. The folks took lunch and drove to Muscatine. Tishie and both girls here in afternoon. The folks home at 6. Then down to Otts. I wrote Lydia, Lizzie Lindley. The Woolfs and Mr Godly in Delavan sending check for work done in cemetery. Monday April 12th 1920 Hattie to Old Ladies Home. I went down to help Fannie in AM. Went to town with Rob in afternoon. Called at Minnie Showers came home with William and Fannie. The Whetstones out for supper. I wrote to Mrs Falk in the evening. weather cold after rain last night.